David Byrd-Marrow | The Chamber Music Society of Lincoln Center. 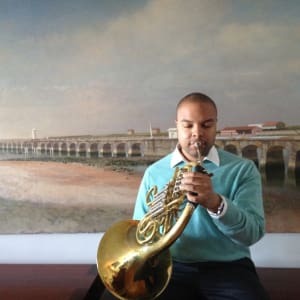 Applauded as “stunning and assured” by the New York Times, American hornist David Byrd-Marrow is the solo horn of the International Contemporary Ensemble (ICE), a new music collective that performs internationally and serves as ensemble-in-residence at Lincoln Center’s Mostly Mozart Festival. Working with a uniquely wide range of performers, he has premiered works by Matthias Pintscher, Arthur Kampela, George Lewis, Tyshawn Sorey, Anna Thorvaldsdottir, Du Yun, Marcos Balter, Wang Lu, Kate Soper, Miguel Zenón, and Chick Corea. He frequently performs at festivals including the Ojai Music Festival, Bay Chamber Concerts, the Mostly Mozart Festival, the Tanglewood Music Center, and as faculty at the Banff Music Centre. Formerly a member of Carnegie Hall’s Ensemble Connect, he has also made guest appearances in the New York Philharmonic, The Knights, Decoda, the Atlanta and Tokyo symphony orchestras, the Orpheus Chamber Orchestra, the Mostly Mozart Festival Orchestra, and the Washington National Opera. As a soloist, he has performed Mozart’s Sinfonia concertante with the Seattle Symphony. He has recorded on many labels including Tundra, More Is More, Nonesuch, EMI, Deutsche Grammophon, and Naxos. Mr. Byrd-Marrow received his Bachelor of Music degree from The Juilliard School and Master of Music from Stony Brook University.